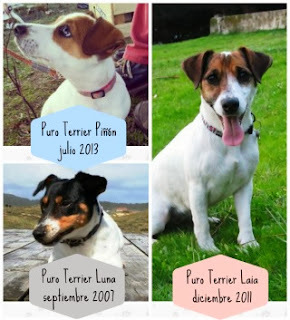 Jack Russell - Puro Terrier: Puro Terrier en Pinterest! Now PuroTerrier is integrated with Pinterest. Pinterest is one of the hottest social networks, which works like a bulletin board to share pictures and interesting links. If you like any of the photos of the blog and want to pin it in your Pinterest, you just have to move the cursor around the photo. Pinterest icon appears in the upper right corner. If you click it, automatically you will have it in your Pinterest. It's easy, isn't it? LET'S PIN PUROTERRIER! Ahora PuroTerrier está integrado con Pinterest. Pinterest es una de las redes sociales más de moda, que a modo de tablón de anuncios permite compartir fotografías y links de interés. Si os gusta alguna de las fotos del blog y queréis "pinearla" en vuestro Pinterest, sólo tenéis que pasar el cursor por la foto. Aparecerá el icono de Pinterest en la esquina superior derecha. Si lo pulsáis, automáticamente la tendréis en vuestro Pinterest. ¿Fácil, no? ¡¡¡TODOS A PINEAR A PUROTERRIER!! !